← MAY SEIGE COMING VERY SOON! 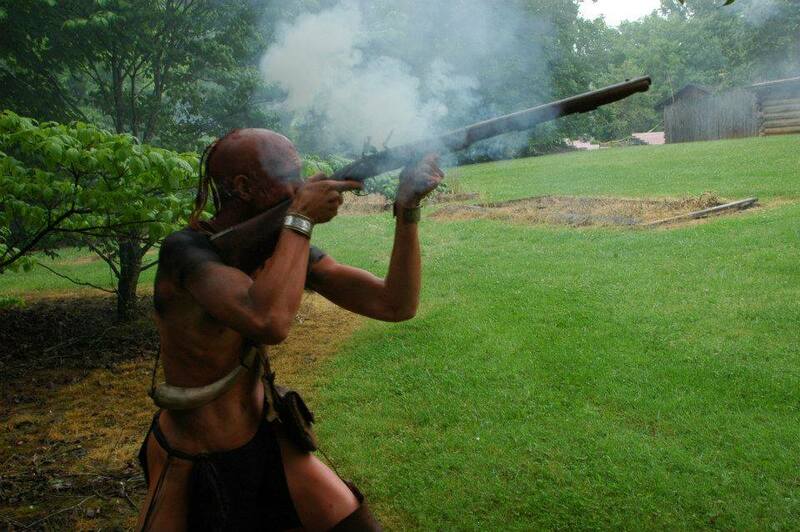 Native warrior assaulting the Fort. It’s mid July, 1776, and the settlers in the area are uneasy. They hear from Isaac Thomas who was tipped off by Nancy Ward, the Wise Woman of the Cherokee, that three bands of Cherokee warriors are descending on them along the rivers systems. John Sevier is alarmed enough to abandon the fort in Limestone he is in the process of building and gathers civilians and a garrison of seventy-five fighters at Fort Watauga. They don’t know when or where the enraged Cherokee will hit but they know that it will horrible. Can you imagine what those people are thinking? The fear in the gut twists at every crack of a twig, rustle of leaves. Two hundred people or so are corraled inside the fort but it is while the women are doing the laundry and milking their cows outside the walls, that the experienced warrior, Old Abram, and hundreds of seasoned warriors suddenly attack . 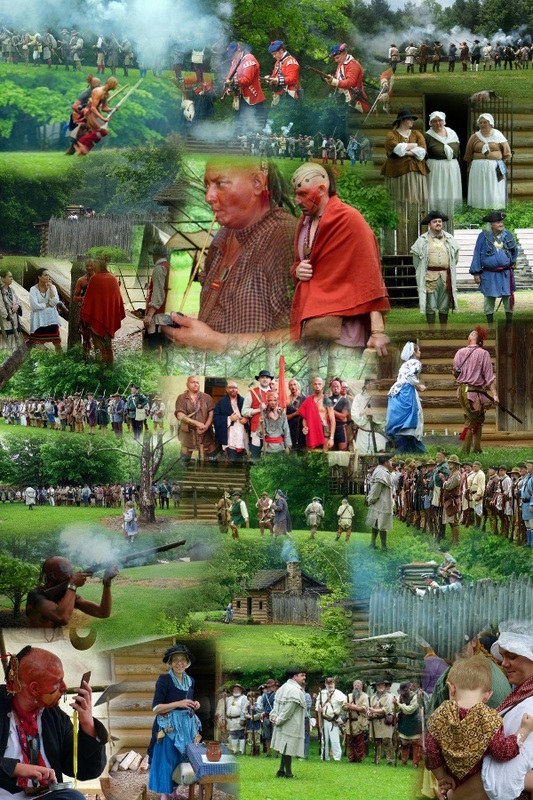 On May 18 and 19, the Washington County Regiment hosted the annual reenactment of this pivotal clash, Native against settler, culture against culture with survival and territory as the ultimate aims. It was a massive event by our standards; each year it grows. The close proximity of the Martin’s Station event has its merits as many people, especially sutlers, just move to the park and set up in what I would consider a mini-vacation state of mind. I got there Thursday evening to stage cabin 4 and already there were a number of members and others already set up, fires blazing and music playing.This year there were as many reenactors or more, 200, participating in this event. The sutlers were set up in their own little village and they were so varied in their wares: Ft. Vause Outfitters, Pumpkintown Primitives, OTTERS, Gary Carrol, Trader Bob, Bruce Roberts, Paul DeRosier, Carolina Threads, Louise Hausman, Wiley House Shoppe, & Roy Carter and Friends. It was a great shopping experience. What was impressive this year was the native camp which was moved from the river (poison ivy abounding) to where the long hunter camp used to be under the pines.It was a terrific idea on many levels, especially where the public could actually see them in all their glory and really appreciate their talks about weaponry and the Cherokee history . The fellows had built hogans and it was really something to see these fierce warriors painted and living ala natural. There were camps all over the place of all the others, our welcome guests as well. Capt. John Moss and the SC Rangers were there to give their support, the British group was there and our friends from Virginia and the Cumberland all were among our numbers. 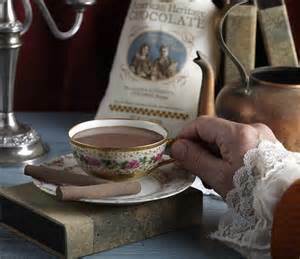 On Friday, the Mars people gave a wonderful demo of historic chocolate, its origins, ingredients, importance in the 18th century, how it’s made and of course, samples of their WONDERFUL American Heritage Chocolate. Throughout the weekend, they actually shucked and roasted the beans, ground the stuff, mixed the spices and kept pouring. The weather was kind of iffy on Saturday with rain in the morning and there was a real question as to whether the battle at 1 PM would actually be able to be held. It would be certainly nonplussing if every one of the participants would say “Boom” or “Bang” rather than have their muskets fire but God was good and the rains stopped, to be continued after hours! I never saw so many members and guests as there were at the raising of colors. The militia was massive. Bob McCroskey almost got his hundred man march to Guilford in this one! The Kids’ Militia was particularly good with all the children marching in perfect unison, wooden muskets held proudly. Throughout the day, we were BUSY with the public, demonstrating various folkways, explaining the history, priming their pumps so to speak. Those of us inside the fort were literally buried under people for two days. The battle was at 1 PM and boy, oh boy, was it something to see, better than at any other time before. Sterling and Adam were on the roof of one of the cabins, men were crawling all over the wall, the Natives were painted and really scary to look at and hear, Sharile was playing Robinson dousing the hapless Native with scalding water, smoke and fire all over and well over 2000 spectators over two days to watch all this! The auction was at 3 PM and there were hundreds of quality items . It took a couple of hours to do it; I’m sure Chad’s throat took a workout but in the end, we made $2400. Not bad at all! It was time to relax, gratefully and the BBQ was held in the auditorium this time as the Museum is now redone. On that note, the Governor was supposed to open up the new Museum on Friday but because of speaker glitches, this was postponed to a later date. Man, was I ready though! I took off from work just to see him, had on a pretty raggedy LIBERTY shirt, my grubby petticoats and apron.The graphic arts teacher at school made me six, yes you read it right, six lapel signs in 18th century script saying ” 18th century indentured:21st century teacher”. “Hi-Ya, Mr. governor, how are ya’?” The principal at school even promised to bail me out of jail if I ended up there. Anyway, after the BBQ we were allowed to go into the Museum, look at everything, see the video. It’s a real gem, I have to say; one of the best small museums I’ve seen. As the night deepened, everyone went back to their camps and one could hear mandolin, pipes, fiddle and laughter. It was such a homey, wonderful set of sounds. It rained again on Sunday morning before dawn but my the time the sun was up, everyone could tell it would be a nice, if hot, day.Harry Jordan led the morning worship and his sermon, from the heart, was very uplifting and set the tome for the rest of the day. After the service, the ladies put out a refreshing high tea for all the reenactors. 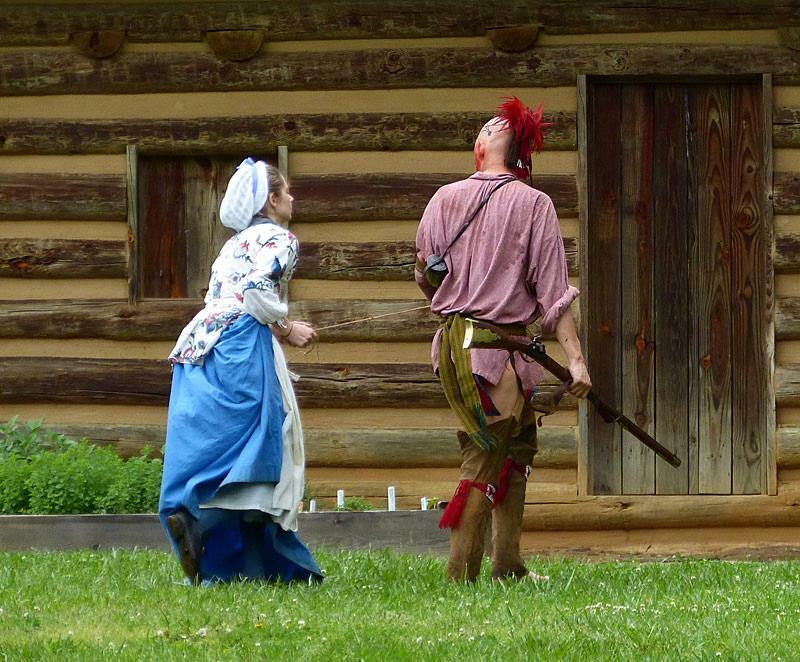 Of course, the battle was repeated, better than even Saturday with the addition of the hapless Samuel Woods played by Sterling Curde, burned at the stake outside of the fort. One thing I really paid attention to was the public attendance. 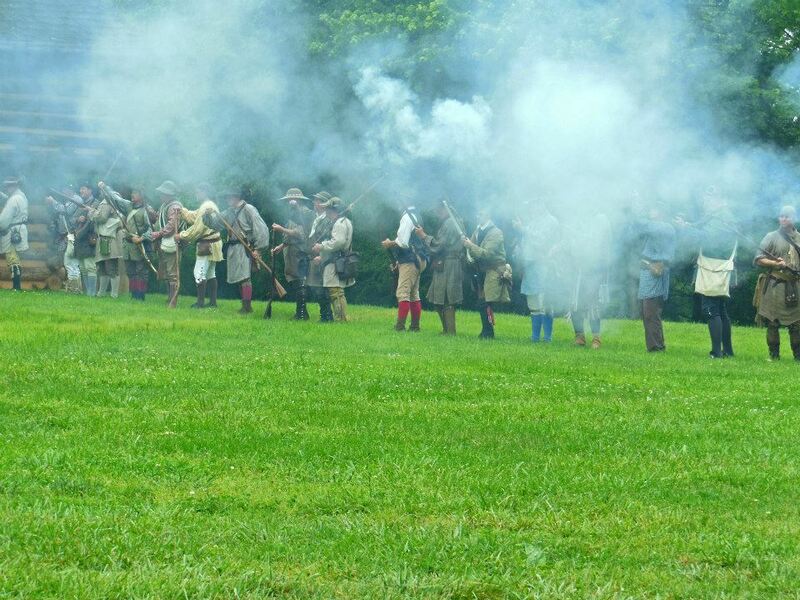 There were a lot of other things going on that weekend, festivals in Unicoi and activities in Johnson City , but tons of people took the time to come out and watch the drama unfolding of the May Seige. It was the highest attendance we ever had and they were appreciative, respectful and asked wonderful questions. Time passes so fast at this event. It seems like it takes forever to come and just whizzes by to its conclusion. One feels the whole gamut of emotions from gut wrenching fear, to the joys and laughter of being together, old friends and new. 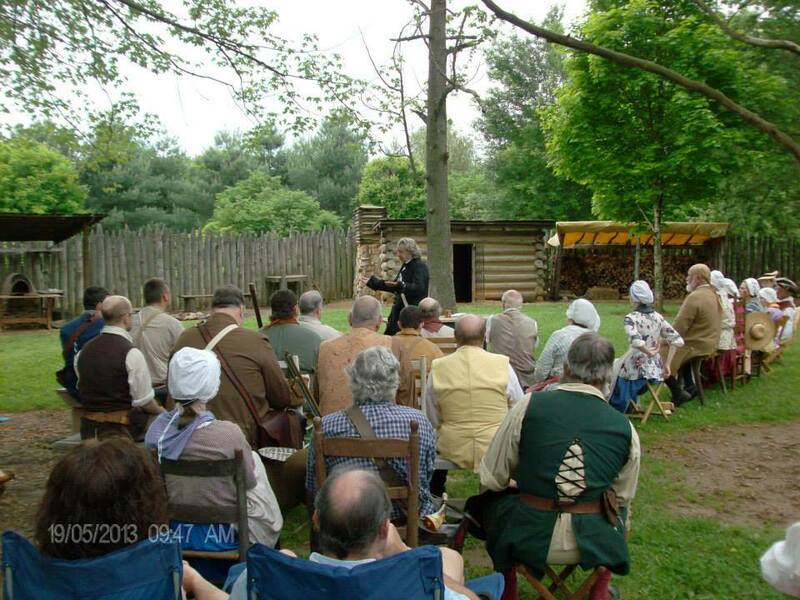 May Seige 2013 was a resounding success! May Seige 2013. Thank you doug Welsh and Retha Reece for the pictures.